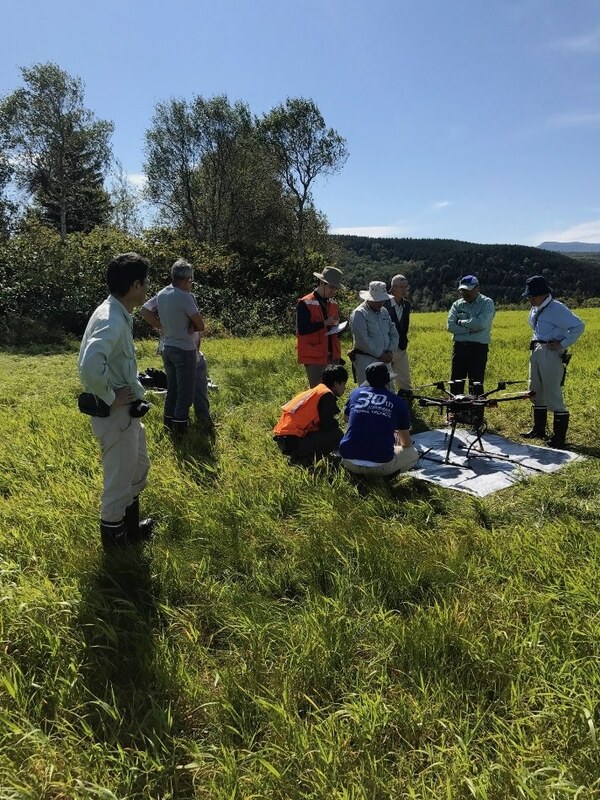 Irving Resources Inc. announced that it has obtained a complete report on drone-based magnetic data from its fully controlled Omu high-grade gold-silver project located in Hokkaido, Japan. 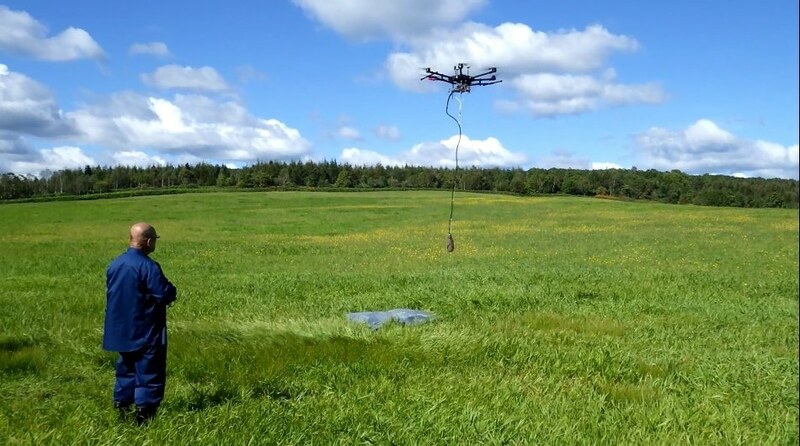 Mitsui Mineral Development Engineering Co., Ltd. (MINDECO) developed an advanced drone-based system in mid 2017. 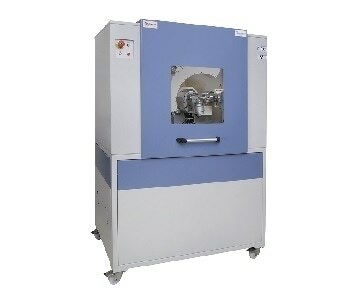 It is the first system in Japan that can collect in-depth magnetic data at low altitude (Figures 1 and 2). 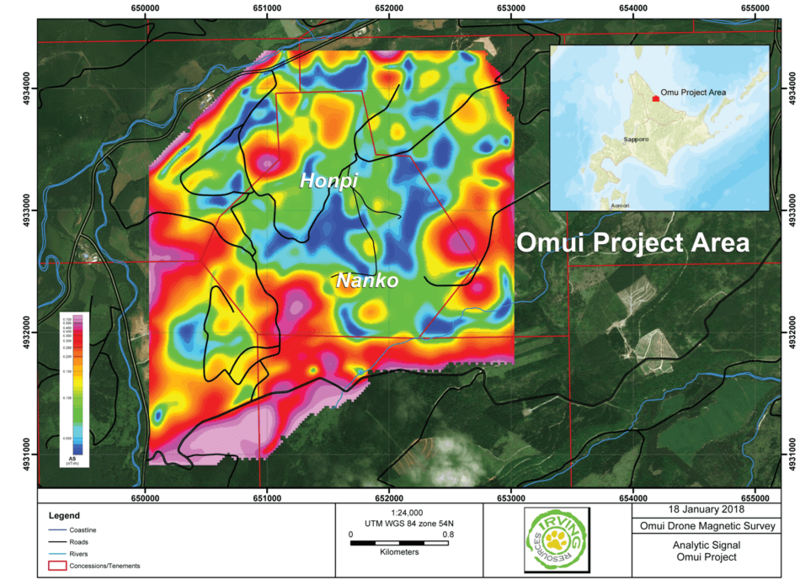 By late 2017, comprehensive magnetic surveys were performed over two large parts of the Omu project (Figure 3). Part of Irving’s 2017 field program was geared towards target generation in preparation for more sophisticated work such as drilling and trenching in 2018. 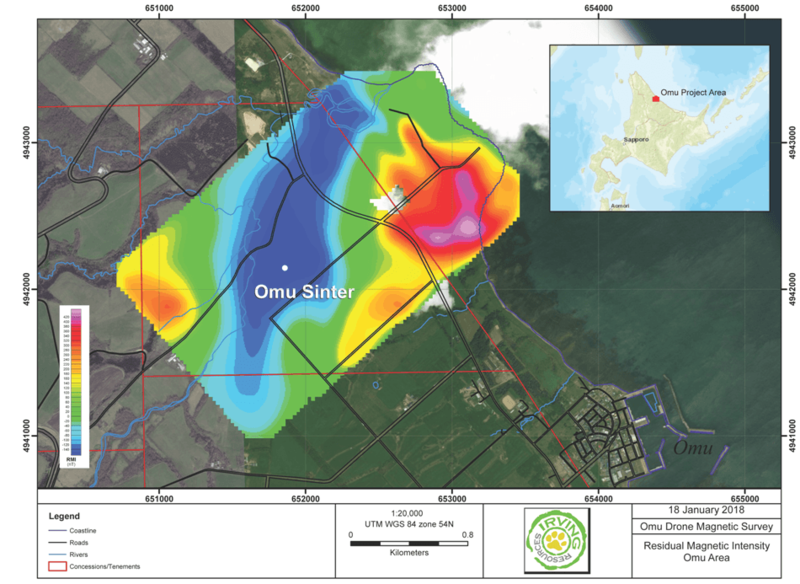 In late 2016, Irving Resources first identified the Omu Sinter, a new hot spring gold target where magnetic data shows a strong anomaly defined by remarkably diminished levels of magnetism (Figure 4). The area around this anomaly is surrounded by silica sinter - the remains of an extinct hot spring system - and hydrothermally altered volcanic rocks. Irving believes that the diminished levels of magnetism reflect a strong hydrothermal alteration related to hot spring activity. Tiny particles of magnetite in volcanic rocks, which otherwise give them a robust magnetic signature, are more or less destroyed by hot, potentially mineralizing, groundwater. According to Irving, the pronounced north-south trending magnetic low, which extends to 2 km and was defined by this survey, reveals a major fault structure along which mineralizing fluids are potentially focused. It was found that this anomaly closely resembles a north-south gradient observed in gravity data, which Irving believes to be a major fault. 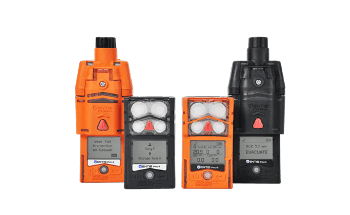 A compelling, large drill target is defined by combined, magnetic and gravity data. 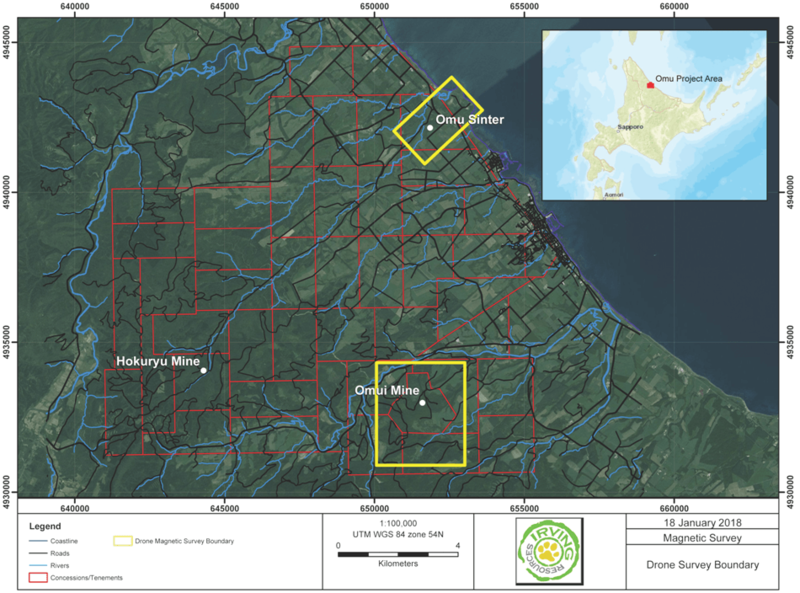 The Omui is a historic mine, where magnetic data exposes an intricate network of features that indicate a complex structural architecture underlying this region (Figure 5). A discrete 1 km long zone of anomalously low magnetism stretches southeastward from the high-grade Honpi vein to the Nanko target, indicating a potential link between the two systems. Moreover, this feature also parallels a gravity gradient trending via this area, probably fault structures along which possibly mineralizing fluids ascended. Another interesting feature is a discrete magnetic high located approximately 500 meters southwest of Nanko. According to Irving, this region may be underlain by a rhyolite intrusion that could have driven the hydrothermal system at the Omui mine. Under the supervision of Irving personnel, MINDECO staff gathered and processed the airborne magnetic data discussed above. Quinton Hennigh (Ph.D., P.Geo. ), a technical advisor and a director of Irving Resources Inc., is the Qualified Person pursuant to National Instrument 43-101 responsible for, and having assessed and approved, the technical information contained in this news release.